It's bonus time again at Intertops Casino. This time around they're giving away $180,000 and all you have to do to qualify for weekly bonuses up to $50 is... play! And isn't that what you were going to do anyway? Right after you've raked the leaves in the yard of course. 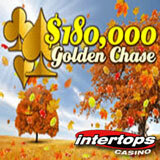 Instead of falling autumn leaves, Intertops Casino players are raking up $30,000 in weekly casino bonus prizes. At the end of the promootion on December 15, one will win a $1000 cash prize as well. Play any of the hundreds of Realtime Gaming games at Intertops Casino and you'll earn points and see yourself ranked on a points scoreboard. If you're one of the top 20 you'll get a $500 bonus -- 300 players are rewarded each week. If you play on any Monday or Wednesday you'll also be eligible for random bonuses up to $150. Intertops also has a poker room and sportsbook. You can use the same account to play any of its hundreds of real-money online casino games or to play poker or place sports bets. Players around the world know that depositing and withdrawing will be easy and that Intertops’ customer service team will be there to assist them as needed.